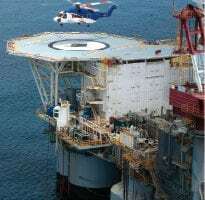 WHEN INDUSTRY ANALYST DAVE Lawrence first saw the third quarter U.S. commercial helicopter shipment statistics reported by the Aerospace Industries Assn. in early November 2004, he had to do a double take. 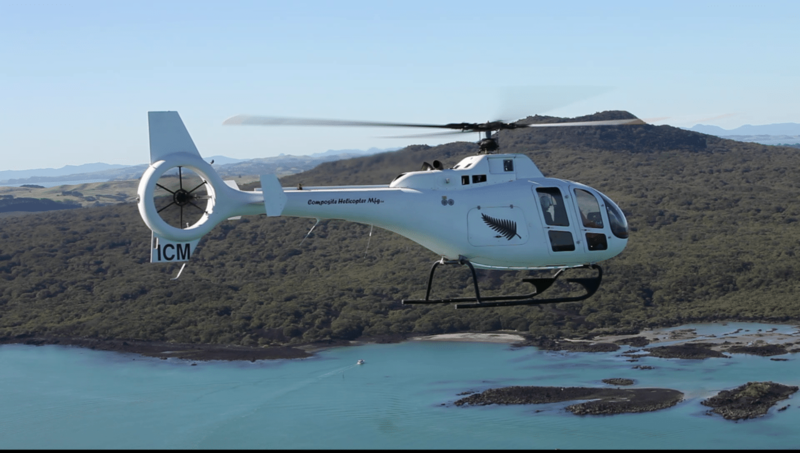 "Something strange is happening with piston-powered helos," Lawrence told Rotor & Wing. 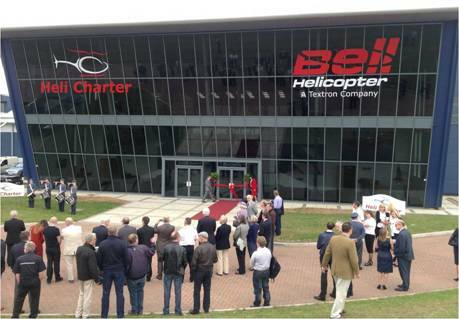 His attention was drawn to the table entry for Robinson helicopters, the primary trainers for the industry. In 2003, the company delivered a total of 128 R22 piston-powered helicopter trainers from its Torrance, Calif. plant, the same flat numbers it had produced for years and the number Lawrence would have predicted. Things had changed drastically in 2004, however. By the end of the third quarter, the company had already beaten last year's cumulative tally with 172 deliveries and was on track to break the 200 mark by year's end. Lawrence, of Aviation Market Research, tends to think the spike is an oddity rather than a trend. "Robinson has been instrumental in making it easy to buy helicopters for training," he said, "but I can't believe [Frank Robinson's] going to keep this up." That company begs to differ. Curt Robinson, vice president of product support for Robinson Helicopter and son of founder Frank, said he's seeing no end in sight. Last year's R22 sales marked the largest annual output in the 1,100-employee company's 30-year history. Going forward, Robinson said the export market, the destination for 65 percent of the R22s, will remain strong so long as the U.S. dollar remains weak. Stateside, he said low interest rates are the key. "As long as the dollar stays low and interest rates stay low, sales will be good." 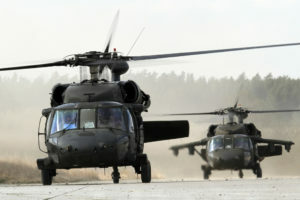 The manufacturer produces helicopters at the rate of 15 per month and is by far the leader in sales among original equipment manufacturers in the United States. 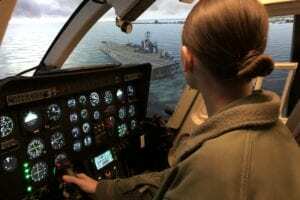 Along with a backlog of five months, another indicator that the training market is robust and growing from Robinson's viewpoint, is the number of pilots seeking to become helicopter instructors. The company offers a three-and-a-half day safety course once a month for 60 students, and Robinson said the class is sold out through April 2005. In fact, the demand is so strong that the company now plans to hold two classes a month. Robinson's rocketing growth on the OEM side is in part fueled by the expansion of Robinson dealers and flight training schools, such as Nevada-based Silver State Helicopters. Started as a single R22 operation in 1999 by Jerry Airola at the Henderson Executive Airport in Nevada, Silver State now has 12 locations in four states--Utah, Arizona, California and, as of early November, Montana--and has more than 500 students enrolled and a fleet of 62 helicopters (10 different models) for the various types of helicopter work the company takes on. Curt Robinson said Silver State is "exploding in training" and has "quite a few ships" on back order with Robinson. Silver State's boom has also been a boon for helicopter simulator manufacturer Frasca International. In June, Frasca announced that Silver State would be the launch customer for the company's TruFlite H flight training device, priced at roughly $150,000 a unit. The simulator is reconfigurable between three single-engine piston-powered helicopters--the R22, R44 and Schweizer 300--and features a two-seat cockpit, Robinson-style T-bar or traditional cyclic, digital sound system and a single-channel projected visual system. John Frasca, vice president of the Urbana, Ill.-based company, has said the order for 10 simulators gives Frasca the "critical mass" it needed to develop an "affordable reconfigurable helicopter device." Bob Summers, project manager for Frasca, said the TruFlite H is currently approved for 5 hr. of VFR credit, though the company is working with the FAA to boost that number, potentially as high as 10 hr. The simulator can be used for up to 20 hr. of IFR credit. 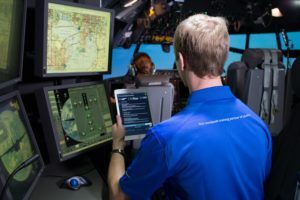 The deal was not good news for competitor FlyIt Simulators of Carlsbad, Calif., who lost in its bid for the follow-on work. In 2002, Silver State had purchased nine Professional Flight Simulators from FlyIt, the seventh of which was delivered in September 2004. The $110,000 flight training devices were approved for 7.5 hr. of credit toward a VFR license (hover training) and 20 hr. toward an instrument rating. The simulator has a full-size cockpit with dual controls, flat panel LCD for the control panel and a rear-projected 6 x 8-ft. screen in the front plus a screen below for visual cues. 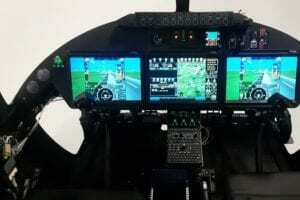 It can emulate R22, R44, Schweizer 300, MD 500 and Bell 206. FlyIt said the system can be used to demonstrate dynamic rollover, tail-rotor failure, autorotation and various emergency procedures. A new player in the Robinson simulator scene could shake things up. By late January, Chino, Calif.-based Flight Link, Inc., expects to have its lower-cost Level 2 simulator for the R22 and other trainers ready for the market. The company's trademark product for the past nine years has been its $3,500 PC-based simulators for flight schools and individual owners. Based on Microsoft Flight Simulator or X-Plane-type software running on a PC that interfaces with collective and cyclic controllers and rudder pedals, Flight Link's devices were originally developed to help students and pilots practice procedures and to familiarize themselves with airports and routes. Matt Henkenius, CEO and lead engineer, said the Level 2 system will provide up to 5 hr. of VFR credit and 20 hr. of IFR credit and come as a turnkey package for $50,000, not including options. The entry will put Flight Link in direct competition with Frasca, the major player in that market, but at roughly one-third the cost. How large is the market potential? Henkenius said he estimates it's "larger than tens and less than thousands." Both he and Robinson would prefer that analyst Lawrence is mistaken.